"You've done a lot of Scouting, church, and school activities with your boys over the years," my wife said one day months ago. "Now it's time for you to do some activities with your daughter." She was right, of course. Having been a dad involved in Scouting and church young men groups, it has been pretty natural to attend Scouting and church youth events with my sons over the years. It hasn't been as natural for me to attend youth events with our daughter. But I could see my wife's point. Thus, I committed to be a chaperone on my daughter's week-long junior high trip. Actually, the trip was only for 9th graders who will be moving to high school next season. The school did this trip for the first time last spring and it was so popular that faculty and staff decided to repeat the event this year. Given the number of students, teachers, and chaperones attending the event, it was decided to rent 15-passenger vans rather than chartering a bus. The teacher leading the tour and school administrative personnel worked for months with service providers to prepare for our week. Extensive and well organized information about preparing for the trip was provided to attendees (and their parents), preparation meetings were held well in advance, and a final meeting was held just a few days before the event to review the students' packing jobs. This allowed us on the morning of departure to move from gathering to leaving within a short period of time. 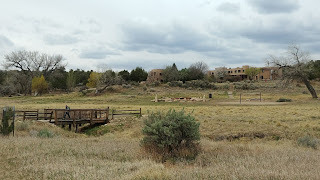 We spent much of that day driving to the Crow Canyon Archaeological Center near Cortez, Colorado. Three other schools spent the week at Crow Canyon with us. One was from South Carolina. Some of these school groups were comprised of 6th graders. Younger students participated in activities that were appropriate to them while older students participated in somewhat more advanced activities. One TripAdvisor reviewer wrote, "Crow Canyon Archaeological Center is a world-class archaeological education center and campus hidden away near Cortez, Colorado. ... Crow Canyon (CCAC) holds summer field school activities for children and adolescents. It has living quarters on the premises as well as a group dining facility for class participants and staff. ... Classes are also offered for adults as well as a summer lecture series, and an international travel adventure series. Housed on campus are various archaeology research professionals (archeo-botanists, field archaeologists, etc.) as well as a talented education staff. There is a small museum store and guest area on campus and an authentic replica Anasazi pit house. CCAC is a working educational institution managing archaeological digs in the area as well as classes. Well worth a visit! Fascinating place!" I agree. Having attended many Scout and youth camp facilities, I was surprised by the quality of our group's housing. Our "cabin" was a modern facility with three rooms that each hosted four bunk beds (8 beds in each room) and two rooms that could fit 3-4 people, roomy bathrooms, and a nice porch area where we held group gatherings. Meals were served in the lodge. The (nice) Gates Building includes offices, classrooms, and lab facilities. The faculty and staff at Crow Canyon were superb. Each group was assigned an educator who worked closely with the group throughout the week. We loved our educator, Cara so much that the school has requested that she be assigned to our school's group next spring. (Yes, the school has already signed up for next year. Crow Canyon is that good.) Our group also worked with other educators in various workshops. Each educator was professional and knowledgeable, and interfaced well with the students. Very impressive. Workshops were, well, work. They were quite rigorous. Each student received a workbook that they used throughout the week, building on knowledge gained step by step. But the workshops were also intriguing and engaging. After spending one afternoon on a simulated excavation in one of the lab rooms, our group spent an entire day excavating at the Haynie site under the close supervision of professional archaeologists. This was tedious work but most of our youth worked quite diligently. Nearly everyone unearthed ancient artifacts that were marked and set aside for cleaning, cataloging, and analysis. 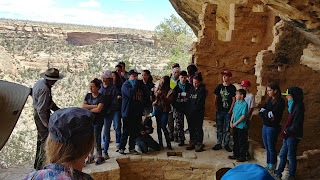 We toured Mesa Verde National Park at the end of the week with our assigned educator. 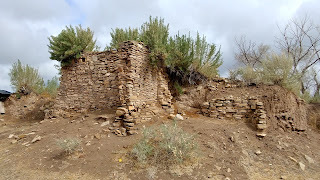 I have been to Mesa Verde on other occasions, but this time was so much more meaningful because we had a much greater awareness of what we were experiencing, having spent the week learning about the ancient inhabitants of the area through many hands-on experiences. We also had a personal guide in our educator. While at Mesa Verde we took a tour of the Balcony House cliff dwelling. The park ranger who led the tour was a remarkably spry and sharp 70-year-old Native American fellow. Not only was he very knowledgeable, he had a marvelous sense of humor that kept us all engaged. At the end of the tour he expertly played a beautiful song on a Native flute to honor the ancestors whose home we were visiting. In the middle of the week our group took a break from Crow Canyon to go river rafting. As luck would have it, the day we had arranged months in advance turned out to be the nastiest weather of the trip, featuring cold temperatures, thunder, rain, snow, and hail. While on our way to Durango, the rafting company called and said that it wasn't safe to do our run that was scheduled for the Piedra River. Upon arriving at the Mountain Waters Rafting Company we consulted with the staff. They felt comfortable offering us two or three runs down portions of the Animas River that runs through the town of Durango. In hindsight I see that the rafting experience we ended up with was much better suited to the nature of our group than the more adventurous Piedra River trip would have been. 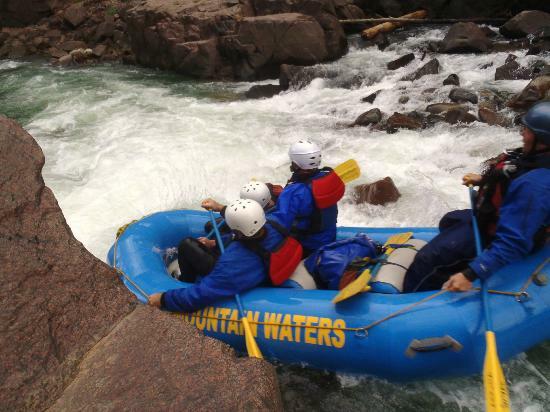 As it was, we donned wetsuits and made two runs down segments of the Animas River in rafts and inflatable kayaks. It was cold, but we had a blast. They offered us a third run, but everyone was done by the end of the second run. I can't say enough good things about the Mountain Waters Rafting staff. Not only were they highly trained and extremely competent professionals, they were very fun to be around. They pulled together our tour on the fly and made it work for us. They also served us hot chocolate and lunch. I heartily recommend Mountain Waters Rafting. Don't just take my word for it. Check the TripAdvisor and Yelp! reviews. On the way home from our week at Crow Canyon we stopped at a tourist trap south of Moab, Utah called Hole N" the Rock, where we took the 12-minute tour. The home built inside sandstone caverns is remarkable. But to me this this place seems pretty strange and quirky, like any number of other odd roadside attractions that dot the American landscape. The stuffed horses and mule in the living room of the house creeped out one of our teachers. After hearing the story about how the critters were obtained, she quipped about the guy coming home and saying, "Look what I found frozen to death in the hills. We're going to put them in our living room!" As we were driving away she said, "There's a place I don't ever have to visit again." The kids, on the other hand, were quite entertained. During our week away from home our community of travelers grew much closer to each other. Pretty much everyone reported greatly enjoying the trip. But after a week away, even with good accommodations, everyone was ready to go home. My daughter feels like this was a valuable experience. It didn't make her want to become an archaeologist but she now has a much greater appreciation for that science and for the cultures we studied. This was not an inexpensive experience. Many students worked to earn money for the trip. In addition to the amount paid by students (and chaperones), the school covered another portion that was undisclosed, although, it was hinted that it may have been about half the cost. I also wish to add that Crow Canyon isn't just for school or youth groups. Anyone who is interested in the cultures of early peoples of that area or who has yen for archaeology is welcome to inquire about visiting. It was a very enriching experience for our group and for me personally. I am grateful that I was able to share this experience with my daughter. This isn't the last adventure I will have with my daughter. Due to her interest in theater, I auditioned with her and we both landed roles in a community theater production that will play this summer. It's already turning out to be a lot of work. But that is a topic for another post.